Lucy Yao will be presenting Anna Thorvaldsdottir and Sigurður Guðjónsson’s Trajectories for prepared piano, electronics, and projection at the Blind Whino Art Gallery as part of the Boulanger Initiative’s WoCo Launch Festival. The picture above is taken at the Reykjavik Arts Museum at the exhibition Cadences of Line and color. For more information about the installation for Trajectories see here. An annual contemporary music festival will be featuring a performance of selected pieces by emerging NYU composers. Two nights only! Lucy Yao will perform works Kyle Brenn and Taylor Arnold. This concert program is curated by composer Trey Makler and the pieces are written by non-binary composers to raise awareness of voices that are left out of the performance canon. Works by Maeve King and Inti Figgis-Vizueta for solo piano and piano with soprano, Emily Thorner. NYU Composers Collective is hosting a concert that features the world premiere of Rohan Chander’s “Complex Identities”: What’s Left Unanswered and a US Premiere of “I.” for Piano Trio. Boston Conservatory Contemporary Classical Music Ensemble: contraBAND presents African Voices in Contemporary Music. silence | visible is a 7 minute work composed and directed by Lucy Yao for quartet with flutes and voices specifically written in response to Fujiko Malaya’s fog sculptures. The piece aims to collaborate with Fog and its amorphous qualities and engage in a dialogue with nature’s fluctuating variables. Fog, which blurs boundaries between the beginning and end, inspired silence | visible to explore the cycles of life that are present in nature, and a wish to relinquish control to the uncertainty of the “how”, and “when”, and more on events as they are happening at that moment. At any given day, nature can give shape to the fog depending on variables that are completely controlled by climate. In this live performance, layers of sound form around the sculpture in an on-site specific work by pianist and composer Lucy Yao. This project is performed as a response to Fujiko Nakaya’s FOGxFlo at the Franklin Park Ruins. 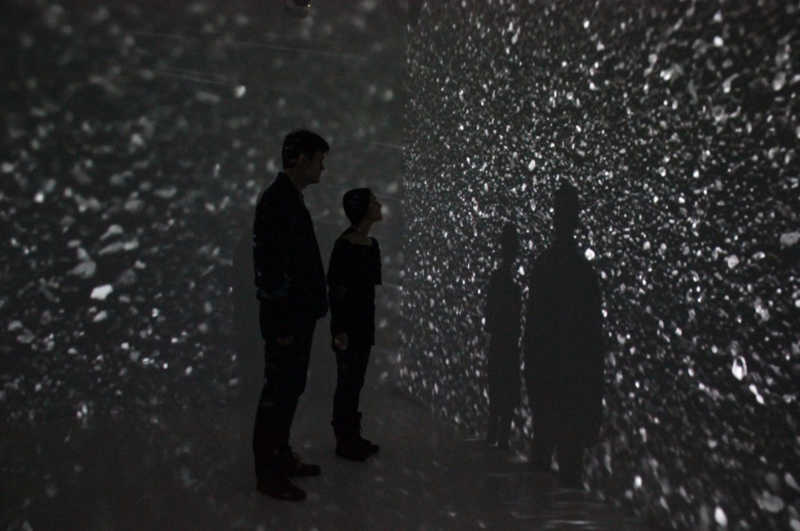 Listeners are welcome to walk into the dense mass of sound and fog to experience the work. silence | visible is made possible by the Berklee Interdisciplinary Institute and the Emerald Necklace Conservancy. And of course, it would not be possible without the help and collaboration with performers Rose Hegele, Morgan Gates, Antonina January, and Caroline Shaffer! Presenting a concert of classical and contemporary works for solo piano at the St. Thomas More Church in Kalamazoo, Michigan that I've worked on for the past year as well as some fresh pieces! Combining styles and genres that are music that could not be further apart, classically trained pianist Lucy Yao brings a program varying from 18-th century chromatic fugues to the distortion of 15 pianos being recorded simultaneously playing back, to the architecture of spider webs, back to the venetian-inspired barcarolle. The program will feature the New York-based interdisciplinary collective, "Strangers in a Room" with dancers Moscelyne Parkeharrison and Barry Gans in a world premiere of "Threshold" (2018) for music and dance by Trey Makler. His music draws from a broad spectrum of techniques, influences, and experiences to craft deeply moving and expressive pieces ranging from tonal to experimental. This eclecticism allows Makler a flexible approach to creating, with his process constantly changing from piece to piece. He especially enjoys collaborating closely with musicians and artists from all disciplines in an effort to break from the traditional solitude that comes with being a composer. To celebrate the holidays, we're playing a variety of Christmas Carols, hymns, and chamber works for SATB and piano, as well as solo works for piano. Ravel in the Rain Benefit Concert! The Danish Academy of Music and Manhattan School of Music bring to you a pre-concert lecture, a concert experience of the Hocking Trio, and a jam session! In the KoncertKirken, a former church converted into a concert venue, the Trio will play contemporary, romantic, and the masterpiece: Ravel Trio in A minor. Program to include pieces for solo piano, violin/piano, Piano Trio, Piano Trio w/ electronics, free improvisation w/ electronics. Enjoy a six-hand chamber performance of Schnittke as part of the first Copenhagen International Piano Festival at the Royal Danish Academy of Music. Free. WHERE: Royal Danish Academy of Music ; Rosenørns Allé 22, 1970 Frederiksberg. 7 Composers. 21 Musicians. 7 Pieces of Music composed, rehearsed, and performed in 24 hours. Taken from the Manhattan School of Music's concept of the concert, Lucy Yao has started the first 24 Hour Concert Challenge as a way to bring performers of different training and backgrounds in collaboration with the composers of the Royal Danish Academy of Music. The composers come in without any written material and meet with the performers at the beginning of the 24 hours. From there on, it is up to them to decide how to structure their compositional process and rehearsals. This is an experiment to see what composers are capable of when they are pushed past their limits to the point of breaking down boundaries of judgment that ordinarily come when there is time to do so. This is a space free from the rigorous expectations and constraints that most classical musicians face daily. This is what happens when chance is taken as the only constant.